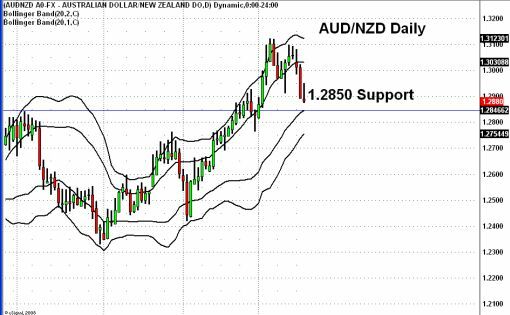 Last week, I wrote that shorting AUD/NZD is my favorite trade. At that time, I said that if the currency pair rallies back above 1.31, then the uptrend has resumed and my call is wrong. However, AUD/NZD tortured me and came within 2 pips of 1.31 (1.3098) before reversing sharply lower. There is no major support in the currency pair until 1.2775, but as indicators adjust to the movements in price, so have support levels. The 1.2850 level is now the new support and that’s where I am targeting. On a side note, I am kicking myself for not posting an official call because the moves have become deeply oversold in these currencies. However I think USD/CAD is going test parity (currently at 1.0105) and EUR/GBP is could fall to at least 0.8915 (now 0.8975).